A contemporary version of a traditional beech derby cane, stained an elegant shade of warm grey. Ideal for use in both the city and country, the grey tones well with many outfits. 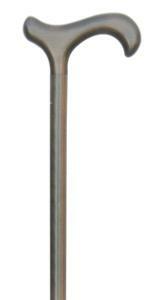 The overall height is 88cm and the cane has a discreet black rubber non-slip rubber ferrule.